After posting every almost every day in May I feel like I've really dropped the blogging ball in June. I'm blaming it on a combination of just too much going on and exhaustion. I haven't been doing much sewing, but it's not from lack of trying. The binding on this well-traveled quilt was sewn in the doctor's office (the doctor's office has the best light for handsewing ... almost makes it worth the long waits), on Alligator Alley in the middle of a traffic jam (we spend 45 minutes at a dead stop ... we have no idea why ... we were stopped for so long that the woman in the car in front of us fell asleep ... we had to gently beep a few times to wake her up), in Miami, in Tampa, and at home. It wasn't that it took that long, it was just that I only got little bits done in between everything else we had going on. Once again I used the Pfaff creative Fabric Mover with Stitch Regulator (I could shorten the name but that's what they called it every single time on the dvd that came with it ... it cracked us up, we're easy that way). This time I did random swirly stitching ... much speedier than the stippling ... and it picks up the swirls in three of the fabrics. My stitches are still a little wonky but I see improvement (or perhaps that's just wishful thinking ...) and it was much easier to use the second time around. This one is pretty big for a baby quilt, about 42" by 53" or so. There's a bit more information about the top here. Oh, so here's my complaint of the day. I ran out of thread 3/4 of the way throught quilting this quilt. I grabbed the spool and some random threads I had next to the machine and went to the fabric store. Our fabric store changed thread ... same brand, same composition, new spool, new lengths, new item numbers! I. and I could not, for the life of us, figure out which thread we needed. After standing there looking silly for far too long we agreed on one and it worked just fine but couldn't they have a color number that's on all spools of the same color and stays constant? Sheesh. I thought it'd be great to be involved in a doll quilt swap so I signed right up. Doesn't it sound like fun? But look at these quilts ... there is so much talent in this group. I'm feeling very inadequate. To top it off, even after reading her blog I don't feel I have any idea about my partner's tastes or color preferences. I've come up with oodles of ideas but most of them aren't "me" at all, and I have no idea if they are "her" either. Right now I'm leaning toward a star pattern in whites and creams with, perhaps, a few ribbon flowers embroidered on. Either that or doing something similar to the crazy quilt I made a while ago ... which would be a lot of fun. Maybe I'll try both and ask your opinions. Yes, this is the stuff that keeps me up at night. Wow, thank you Valerie! I'm walking on a cloud right now after such a wonderful compliment! 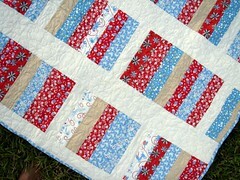 I love the quilt you are working on and its just lovely. I couldn't believe the quilts from your group. So darling! I laughed outloud about the lady falling asleep in the car. Hilarious. What a great post. You'll do just fine with anything you do. 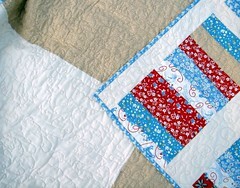 Love these colors and the quilting is fab! Inadequate...I don't think so...they will all want you for a swap partner. I know I would! Oh my goodness! 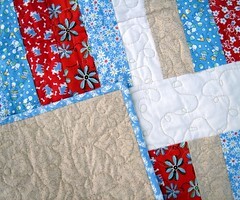 I just found your blog and I absolutely love these quilts. Your color schemes are perfect! I'm always particularly attracted to the ones with a good splash of white, they are so fresh. And thank you so much for sharing your alternative to stippling. Your work is incredible, I can't imagine how it could be any better. GORGEOUS!